Kim has been planting a lot of flowers in the backyard. She has created a tropical garden along one side of the house and in addition has various hanging and potted plants. 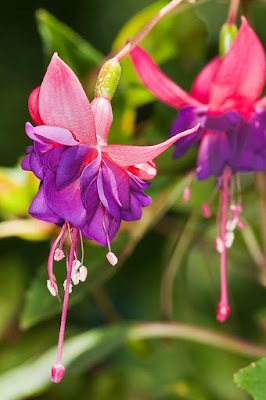 On two planters are Fuschia. I also took the opportunity to experiment with the macro flash. I was trying to do everything handheld despite knowing how challenging it would be. I have several more I took earlier this morning with a tripod, perhaps I'll post those later. Technical Specs: Canon 1Ds2, 180mm macro, f/14, 1/250s, ISO 1250, MT-24 flash. Anybody know what this bird is?